The leaf of the perennial evergreen plant Pyrrosia sheareri (Bak.) Ching and P. Lingua (Thunb.) 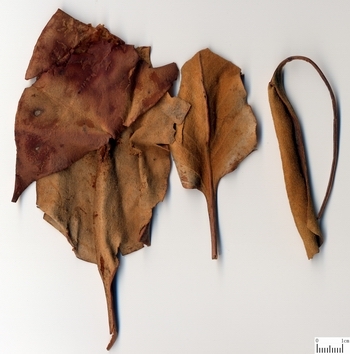 Farwell, or the leaf of P. petiolosa (Christ) Ching. The first two are called Da Ye Shi Wei, the later one is called Xiao Ye Shi Wei. In all parts of China. Collected all the year round. Pyrrosia sheareri is slight in smell and slightly bitter and acerbic in taste. P. lingua is light in smell and bland in taste. For Da Ye Shi Wei, the big, thick one with hairs on the back is at best quality. For Xiao Ye Shi Wei, the thick, clean, tidy one is best. Cut into segments and unprocessed. Sweet and bitter, slightly cold; lung and bladder meridians entered. Induce diuresis to treat stranguria, clear lung-heat to relieve cough, cool blood to stop bleeding. It can induce diuresis to treat stranguria. It is a common herb for stranguria. It is slightly cold in nature and can clear heat. So it is especially suitable for heat stranguria manifested as dark yellow urine, difficulty and pain in micturition. It is usually combined with Hua Shi, Mu Tong and Che Qian Zi to mutually reinforce the actions of clearing heat and relieving stranguria. For instance, it can be ground into power with Hua Shi for oral taking from Sheng Hui Fang. It has actions of clearing heat, treating stranguria and cooling blood to stop bleeding, so it is especially suitable for blood stranguria. For instance, it is combined with Pu Huang, Dang Gui and Shao Yao in Shi Wei San from Qian Jin Fang. For urolithic stranguria, it is ground into powder with Hua Shi and swallowed with rice water or honey soup in Shi Wei San recorded in Gu Jin Yan Fang Lu (Ancient and Modern Effective Prescription) or combined with Jin Qian Cao, Ji Nei Jin, Hai Jin Sha, etc. to mutually reinforce the actions of treating stranguria and removing stone. For edema, it is combined with diuresis-inducing and edema-alleviating herbs, such as Zhu Ling, Ze Xie, Yi Yi Ren and so on. It has the actions of relieving cough and dyspnea by clearing lung-heat. It is usually combined with Yu Xing Cao, Huang Qin, Lu Gen and so on to reinforce the actions of clearing lung heat and resolving phlegm. For hemoptysis, it is commonly combined with the herbs of clearing lung-heat and resolving phlegm, cooling blood to stop bleeding such as Ce Bai Ye, Bai Mao Gen. It has the actions of clearing heat and cooling blood to stop bleeding. It is suitable for hemorrhage due to blood heat manifested as haematemesis, epistaxis, hematuria and metrorrhagia and metrostaxis. 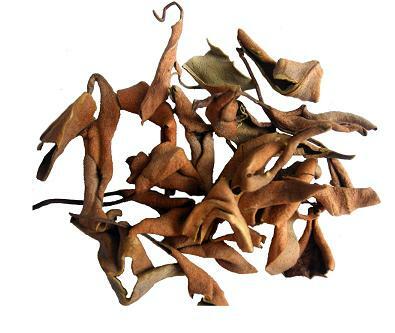 It can be used alone or combined with herbs such as Ce Bai Ye, Zhi Zi, etc.